Congratulations to our newest Graduate Rex and his raisers Jenna and Sue! Susan wrote - "Fabulous news - we just learned that Rex graduated and has been matched to a 17 year old high school student in Pennsylvania. The family also has a 10 year old son and 20 month old daughter. His new life-mate is active in school, plays in the band and reportedly loves both Rex's serious work side and silly, fun side. His trainer, Kaelin described Rex as "...an absolute pleasure to train...putting a smile on her face...and picking up guiding so easily..." I can hardly describe how incredibly proud both Jenna and I are of Rex. We both feel so lucky to have been part of making this happen. Thank you so much for being our guides." Way to go Rex and your loving first mates - Jenna and Susan! Here's another, yes you guessed it, handsome young man posing for his "money" shot. We need to add some women to this mix. Cochise is now a helpful and loving guide to a gentleman living in Ontario, Canada and he's his fifth guide dog. Their transition in class at The Seeing Eye was smooth and effortless and both will enjoy a schedule full of adventure. Early on in his training, Cochise's exuberance, boundless energy and love of birds was harnessed by his caring and loving trainer Shannon. 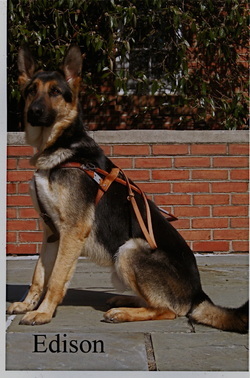 Cochise is an intelligent dog who has a continual eagerness to learn His success as a guide dog is not only his, but that of his loving raisers Sheila and Roger and trainer Shannon. We wish him and his partner many years of love and service. Fancy has joined the "Goldens Graduates Club of Guides" after spending 16 wonderful months in the loving care of Maddi and Shari. Congratulations to another handsome young man who graduated to Guide and Partner under the gentle and loving tutelage of Sheila and Roger. What a lucky dog - and here the expression couldn't be truer - for the dog and his companion. Edison has been paired with a gentleman from Virginia and is his seventh guide. Edison has a gentle, loving personality and is intelligent and quick to learn. His "outgoing" disposition and eagerness to meet people and other dogs makes him a charmer. He enjoys his "peace and quiet", especially after dinner just like the rest of us. Edison's partner will introduce him to the world, literally, as he is a globetrotter. Edison was also "crowned" as the safest dog in traffic. He was trained and matched by Janice of The Seeing Eye. They can all be proud of Edison's training and the fact that he has fulfilled his destiny by helping someone remain independent and confident as they greet each day's challenges. 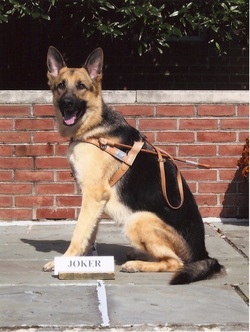 Sheila and Roger lovingly raised and trained Joker to become a guide and partner to a sight impaired gentleman. Doesn't he look regal? This photograph is better than that taken by some wedding photographers. Joker decided he wants to live in Arizona and has taken up residence with a retired gentleman. He's a pup who is very outgoing toward people and tolerant of other puppies' behavior toward him. He likes to please, especially when it pleases him as well! He knows his basic commands well and is quick to catch on to new ideas. Joker loves to be petted and will often bring a toy to you in his mouth, sit and stare until you give him some petting and a hearty "good boy"! Overall Joker is a wonderful little guy who will be a very capable and loving guide. Here's Windy getting prepared to go on his Town Walk for observation. He found his partner early in 2012. Windy has been paired with a woman who frequently travels by plane to visit her family and spends summers camping.